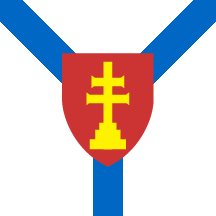 The banner of arms of the municipality of Arilje (Western Serbia) was adopted in October or November 1998. The flag includes a red shield with the cross of St. Achilles, the patron of the old church in Arilje. The blue "Y" represents rivers Rzav and Moravica.